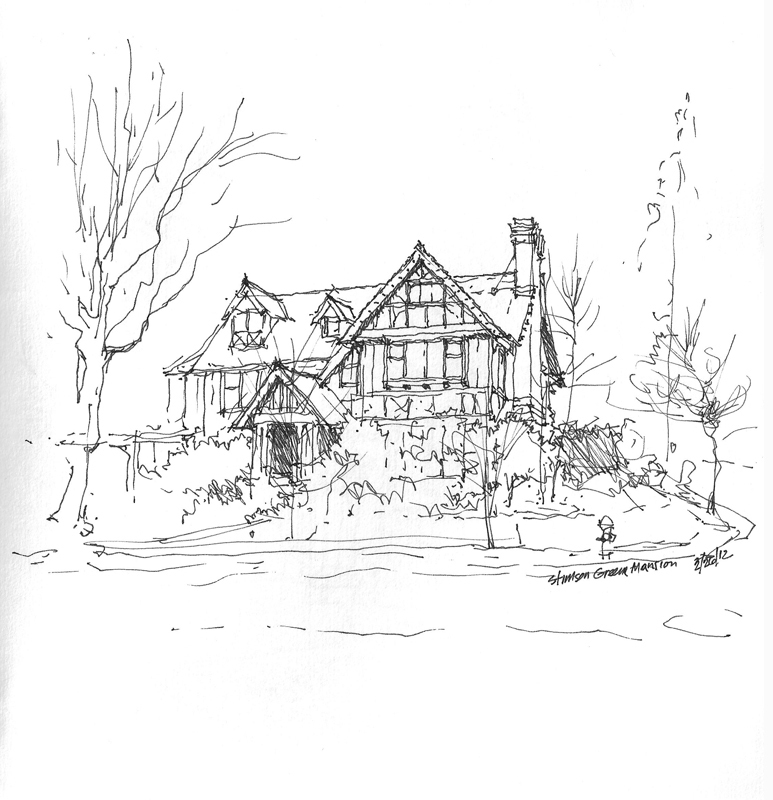 We had a great turnout yesterday when the Seattle Urban Sketchers group met at the Stimson-Green Mansion for its monthly sketching session. Spokane architect Kirtland Cutter designed the residence for C. D. Stimson, early Seattle industrialist, and his wife Harriet Stimson. It was completed in 1901. In 1915 Joshua Green, a leading figure in the Puget Sound boating industry and later a banker, purchased the house from the Stimsons and maintained almost all of its original features. When Green died in 1975, the Historic Seattle Preservation and Development Authority purchased the property. After working on its restoration, Historic Seattle sold the property in December 1977 to Priscilla (Patsy) Collins, granddaughter of C. D. and Harriet Stimson, with an easement protecting the main house, carriage house, and grounds from demolition, alteration, or remodeling. In 2001 Collins donated the mansion to the Washington Trust for Historic Preservation, which provides continued stewardship. As an example of eclectic architecture, the house’s English Tudor exterior features half-timber work, wooden gables, and pointed arches, while the interior rooms combine elements from various historical styles including Moorish, Romanesque, Gothic, Neoclassical, and the Renaissance. The first drawing is a 20-minute sketch of the exterior I did while waiting for the 10 am meeting time. The second is a view of the central hallway looking out from under a Romanesque style arch supported by clusters of small columns. The space ascends the main stairway to the upper two floors and extends back to a warm, sunny dining room on axis with the front entry foyer. I always enjoy drawng these kinds of transitional spaces because of the multiple viewpoints they offer. 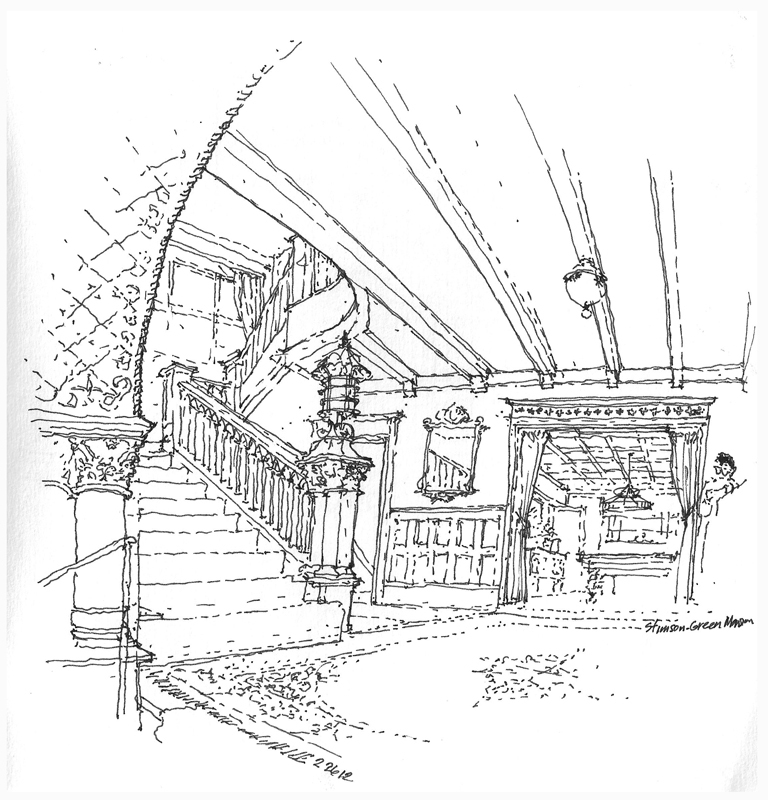 This entry was posted in Drawing, Seeing, Urban Sketchers by FC_admin. Bookmark the permalink.